Today, our special guest is Ilse Eisele, wedding photographer. Ilse and I share a treasured experience--meeting my favorite wedding photographer Jasmine Star at her event "The Fix: D.C." which was held in the Gala Theatre in Northwest, Washington D.C. a few years ago. The event was memorable and Ilse captured a great photo of me with my role model (J* is awesome)! The photo above features Mr. Tim and Mrs. Julie Vandeman, friends of Ilse, on their wedding day. Today we're focusing on the photo above that's worth a thousand words and the photographer's bio. The lovely couple is beyond busy, as is the photographer so they did not have time to write a short essay on the meaning of love. Reach out to Ilse in the comment section, letting her know what you think of her photography. She'll visit to reply to any questions you may have for her about her work. Ilse Eisele is a professional wedding photographer whose love for horses and people gives her a zest for capturing memorable life moments with her camera. Ilse's photography of horses has been featured in magazines and her wedding photography is a cherished treasure by her brides and their husbands. Ilse is a pastor's daughter and Auntie to her brother's and his wife's children. She loves helping people so much that she's in graduate school to become a counselor. 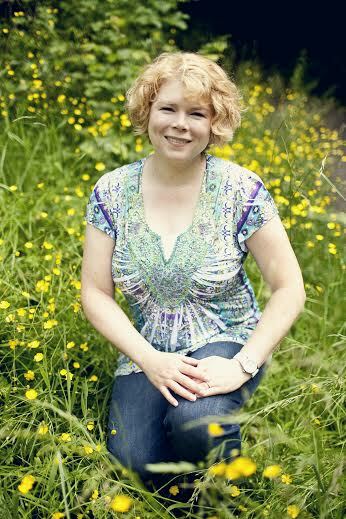 Visit Ilse's professional website, www.ilseeisele.com to see her award-winning photography. Devotional by Mary Manners: Is Today Really Necessary? Traditionally, the posts will be published on the last Monday of every month. I hope you will enjoy visiting with Mary. She has a wealth of wonderful wisdom to share that I believe will encourage you in your journey through life. My dad has always been my hugest inspiration. Long ago, when I was barely a teenager in the early days of my middle school journey, I came home following a particularly rough day to find him sitting on the front porch waiting for me so he could ask about my day. I joined him on the concrete landing and he spent a good hour listening while I vented about the trials and tribulations of being a thirteen-year-old in a cruel, cruel world. I imagined he had no idea what I was going through, since he couldn't have possibly ever been as young as thirteen. Little did I know! 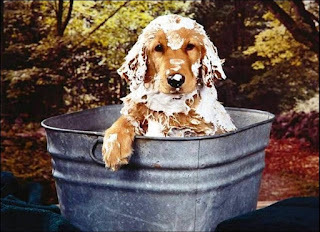 The next day, Dad came home with a small treasure for me--a poster with the most forlorn-looking bloodhound sitting in a washtub full of soap bubbles that had been dumped over his head. The caption read, "Was today really necessary?" Dad helped me mount the poster in a place of honor on my bedroom wall, and then we sat together and talked some more. That's when I began to understand the power of adversity in shaping who I am as well as my life's path. Today, I use the trials of my life--both the small inconveniences that jab like bony fingers along my rib cage as well as the tsunamis that sweep through to wash away any semblance of sanity--to shape and mold my writing. Characters come alive when their story is infused with nuances of my personal trials. In daily tribulations I find a never-ending fount of inspiration. The passion to write the next story burns continuously inside me, and with every detour that comes my way I know that the round-about will lead to another exciting chapter. My dad succumbed to Non-Hodgkin lymphoma thirteen years ago, but his memory is alive and well in the poster that has traveled with me through the decades. It now holds a place of honor on the wall across from my office desk. Each time I glance up to read the caption, I smile and think, "Yes, today is really necessary and thank you, God, for allowing me another breath, another test…and another chapter." REFLECT: God is the master of the universe. He hears our every cry and knows the deepest desires of our hearts. His plan is for good, not to harm. Trust in this and carry on. PRAY: Dear Lord, please help me to trust in Your will and Your plan for my life. Help me to be fearless in each trial and heartache that comes my way, knowing fully that you hold the paintbrush for the universe, and with each careful stroke You form the path of my existence. Loren Jackson returns to the blog today to show us her lovely work as a wedding photographer! She's also speaking about what love means to her through her professional lens. Loren's clients, Mr. and Mrs. Ray, are featured in the photograph above on their wedding day. Read on for their comments about how they look at love. To me love is starting everyday together. Sharing unforgettable moments even if it is the simplest of things. Love is knowing that you can always count on him through toughest of times. Last not but least, love is ending everyday together! Love is just a word until you find some to give it a definition. Love is facing obstacles and overcoming them together. Love is a short word, easy to spell, hard to define, and impossible to live without. As a wedding photographer, love is spending the most important day with two people who are about to begin a journey with one another that will impact and shape lives for decades to come. Love is capturing tiny details that help write the couple's love story that is going to be shared with generations to come. Love is 50 years down the road when my Brides can sit down with their granddaughters and flip through their wedding album together telling stories, laughing, and maybe wipe away a couple tears. Loren is a Wedding Photographer in Northeast Ohio. She’s a wife and a fur-mommy to two huskies and a Rottweiler. She loves spending her Saturdays with her Brides and their handsome Husbands. 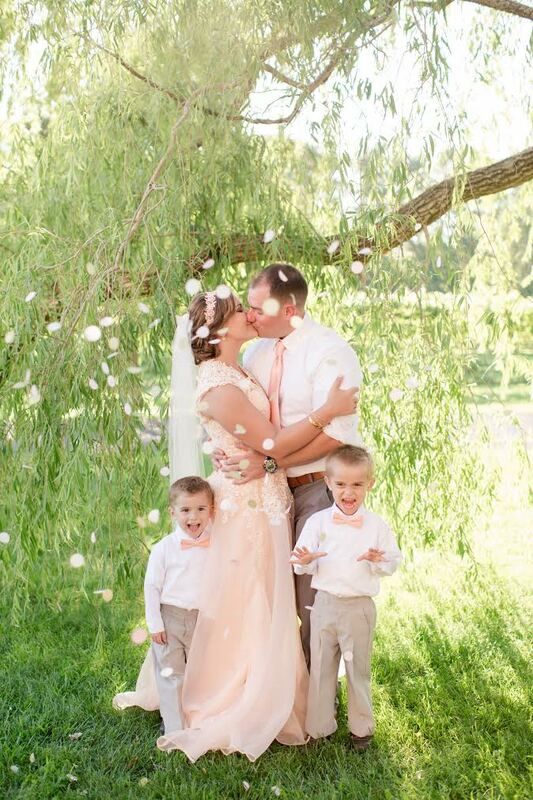 Loren strives in giving all her couples wedding photos that will be cherished by future generations. Welcome Loren to the blog today! :) Loren is a professional wedding photographer and today she's here with her husband to talk about what love meant to them on their wedding day and what love means to them now as a happily married couple. 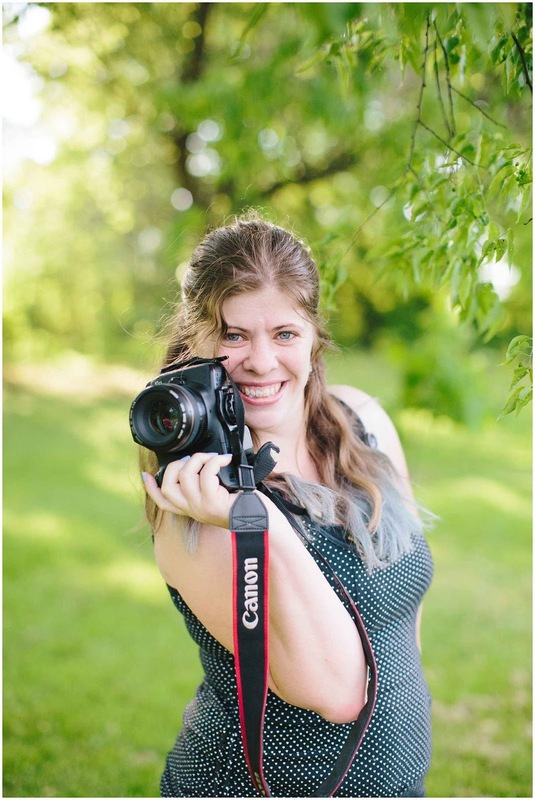 Loren, who is a dear friend of Kaitlin Noel, will also speak about what love means to her through the lens of her work as a wedding photographer. So without further ado, I introduce you to Mrs. Loren Jackson! Take it away, Loren! Love is dreaming of your wedding day since you were a little girl. Love is butterflies, excitement, and anticipation. Love is walking down the aisle holding onto your momma, staring at the man you will spend the rest of your life with. Love is hour long bridal portraits, and your soon-to-be Husband not complaining one time about all the pictures. Love is your Husband promising not to smash cake in your face, but he does it anyways. Love is I don’t dance and God gave me You. Love is celebrating your wedding day with your closest friends, family, and being blessed to have four sets of Grandparents who have been married for 50 plus years. Love means always thinking of your spouse before yourself. Love is stopping at the gas station for one thing, but bringing home a bag of M&Ms. Love is getting up in the middle of the night to leave the dogs out, even if it’s not your turn. Love is going one (or five) steps above just to make their day a little brighter. Love is random texts throughout the day. Love is watching a basketball game with your husband, and all you want to do is watch a chick flick. Love is watching a chick flick, and giving your crying wife a box of tissues. Love is the soft forehead kisses hello, the hugs good-bye, and the “I miss you” texts while away. Love is feeling goosebumps race across your body after hearing him say “I love you, baby." Love is backrubs, encouragement, cuddles, and support. Love is promising your life to one man. Promising unconditional love through all the good times, and all the dark times. Promising to put your marriage first, and always finding new ways to fall in love. Love is dreaming big together. It’s looking at house plans, and envisioning that dream home decorated for Christmas, with the pitter patter of little feet running around and giggles filling the air. Love is his smile, and his hand to hold. Love is tears falling as I sit here and type this, and explain just the few things that makes me love my husband more and more everyday. Love is marrying a man so good to you, you question yourself daily what you did to deserve a man so loving. Love is seeing a nervous but excited Bride putting on her dress. Love is the white dress, the veil, grandma’s jewelry, and love notes. Love is the first look and the tears in the Groom’s eyes. Love is my Brides crying when they see their wedding photos. Love is capturing memories for not just my Bride and Groom, but for the generations that are to come who can share in those memories, as well! Kimberly Rose Johnson, author of the book Island Refuge, is here today to talk about the creative process she experienced in writing her book. I hope you will enjoy learning more about what helps an author create a good book! :) This guest post by Kimberly is delightful. I loved it and I hope you will too. Have you ever had a song in your head you couldn’t stop from playing over and over in your mind? That’s what Island Refuge was like for me when the story came to me. I had gone on a research trip via Amtrak to Leavenworth, Washington. The route ran along the Puget Sound for part of the trek. It was gorgeous! I’m a huge fan of the scenery in Washington. I lived there while I went to college and had a million dollar view of Lake Washington and Mt. Rainer from my dorm room window. It was spectacular. While in college I was in my school’s traveling choir, so I had the opportunity to visit one of the islands in the Sound as well as travel all over the state which gave me a good feel for the area where I like to set my stories. While I was in Leavenworth I visited a B&B (bed and breakfast). The funny thing is, I was there to research for a series I was writing for Harlequin’s Love Inspired Heartsong Presents line and left with another story idea. My mind meshed the idea of a B&B with the Puget Sound and suddenly Wildflower Island was born. The story percolated in my thoughts for several months before I decided I’d better write it. 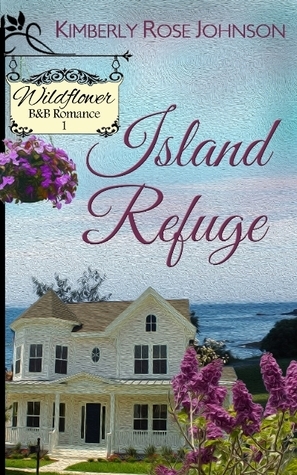 My Wildflower B&B Romance series follows the lives of three women whose lives where changed when they came to Wildflower Island, specifically Wildflower B&B. In book one, Island Refuge we meet Zoe, a five-star-executive chef. She is running from her past, but discovers that in order to face her future she must come to terms with her past. In book two, Island Dreams, Piper, a land developer, comes to Wildflower Island with the hope of building a resort. She is faced with a lot of opposition and must learn that she can’t do it on her own. In book three, Island Christmas, Rachel, a strong secondary character from book one returns with dreams of her own. These woman are all strong women with a dream and it was a blast writing their stories. I truly loved writing this series of sweet romances that are more than just another romance, but stories with easily fit into the women’s Christian fiction genre as well. with her husband and children during their wedding "the second time around." Today's Worth 1,000 Words post is a bit different than the rest because the featured photo is from the wedding photographer's own wedding, the "second time around" after being married with children. 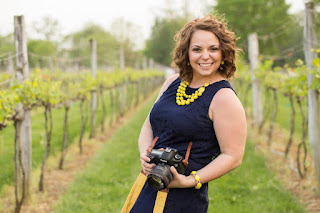 The photographer who captured the photo is Katelyn James and while Katelyn's wedding photography will be featured later on in this series, today is all about her friend Kaitlin Noel of Kaitlin Noel Photography! 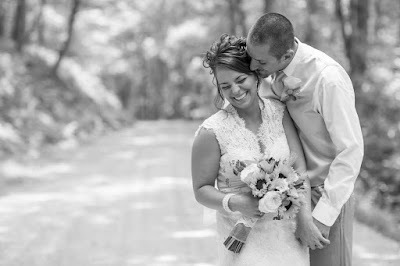 Kaitlin would like to share the story of what love means to her through the lens of her work as a wedding photographer, her special day as a blushing bride and her life as the wife to the man of her dreams. My husband and I renewed our vows on our 5 year anniversary in 2014 in front of all of our family and close friends. Our first wedding was a very rushed, last minute and ill-planned event that was more focused on the "wedding" than the marriage. After five years of marriage and two kids later, we really thought about our marriage, all we have been through...all our love for each other and these kids has done for us as individuals, a couple and as parents. We wanted to create a day where we could REALLY focus on our love and our family which are the core values of our marriage. Love is so much more than attraction, gifts on holidays, date nights, trips, and romantic gestures. It’s about being able to just sit next to this person. Breathe in the same air. Sitting in silence, and be PERFECTLY HAPPY. Perfectly content. A feeling of home. Acceptance. And ultimately, unconditional support and respect. Raising children is TOUGH! We had our boys, Nicholas and Ryan, back to back and it was by no means easy. It was taxing. We were tired. Poor. And our "romantic fire" was turning into ashes. We knew that we loved our kids and loved each other, but often OUR love was the furthest thought...it was all about the kids. As of lately, we LOVE showing the kids how in love we are. When cooking dinner, Michael will often come up behind me and offer to help. He will grab me away and dance with me by the stove and the boys come running in. They even scream..."Kiss her dad!" We are TEACHING them about love by SHOWING them what true love is. Love isn't perfect. It is not roses and chocolates and jewelry all the time. It’s about MAKING THE TIME to show each other that you on their mind and always in their heart. We are a huge fan of little notes tucked in each other’s work bags, coffee mugs, or suitcases before we travel on separate business trips. We figured out that we speak VERY different love languages and need different types of support. For us love is absolutely effortless, but CULTIVATING love is hard work in that you must never, ever stop. Marriage, though a blessing, is work. BOTH members need to work to make sure each other are respected, supported and FEEL safe. His pain is mine. My sadness is his. We are a TEAM. As a wedding photographer, I get to capture HUNDREDS of love stories. Though each one involves a pretty wedding with music, drinks and captivating floral arrangements....each wedding is perfectly unique. My couples are truly radiant and spirited people that THRIVE on each other. They get their joy from their spouses and vice versa. I love capturing the way each specific couple uses their OWN love language to communicate. I have had grooms that are hair brushers (they constantly sweep their spouses hair from their brow line and cheek). I have had hand kissers and holders (where they never let go of their spouses hand and always lift it to their lips for a soft kiss). I have had twirlers, ticklers, funny-facers and tacklers. Each expression of love in unique and quite frankly ADORABLE to watch play out. I am a blessed girl to see so much love in my life time, let alone be the one that gets to capture it for their generations to look at for years to come. I am blessed with a wonderful husband, amazing children, and an incredibly moving career. Love surrounds me every day and I wouldn't trade it for the world. 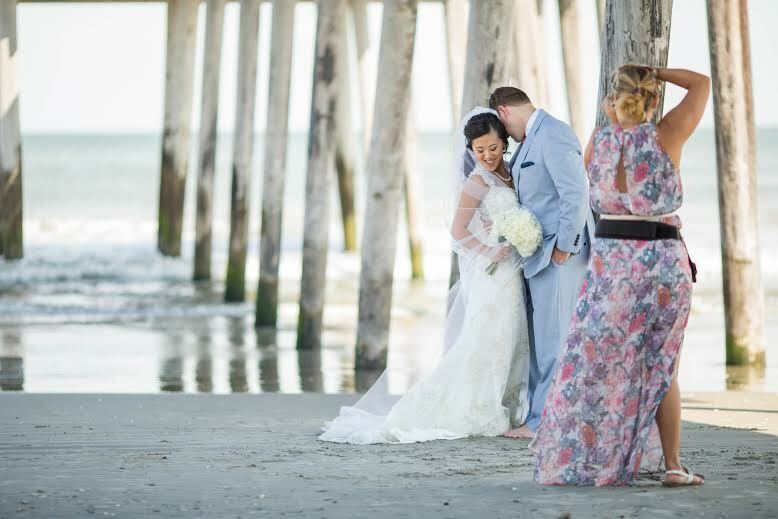 Kaitlin Noel Hebert is a professional wedding and portrait photographer based in Cape May, New Jersey. She’s the mother of two perfect little boys, Nicholas and Ryan. Kaitlin is the “police wife” to her husband Michael. She is also the mother to a French bulldog named Ellie who was named after her favorite movie character Elle Woods from the movie Legally Blonde. Kaitlin is approaching her fifth year as a professional photographer. She enjoys traveling for destination weddings around the world and traveling to new locations with her husband and family. Kaitlin spends her free time with her family at their beach house and up on the boardwalk eating as many deep fried Oreo cookies as possible. Kaitlin’s DSLR camera has become an “extra limb” over the years, so she finds it challenging to ever lay it to rest. However, she finds that it’s nice to unplug and invest in more photography education. Kaitlin attends retreats to become motivated and re-inspired to do what she loves most—photography. At first, I didn’t think I would like this book but reading it proved me wrong. Author Delia Parr spins a story about tradition, life changes and faith in God amidst unexpected events in a way that resonates with the reader. The reader may feel connected to the main characters within the first few pages of the book. Yes, Parr is that good of a writer! Chapter 1 introduces the reader to the main character Martha Cade in her glory—she is working as a midwife surrounded by female assistants—helping to birth a baby but she’s not in a hospital, she’s in a residential home which as true to real life in the fictional town of Trinity, Pennsylvania in which the story is set. The year in which the story begins is 1830. The characters are not always endearing but they are believable from the beginning. Parr does an excellent job of making Martha’s career as a midwife not only believable but interesting. Parr has a way of dropping the reader right into the action from the first line of the story to the final word on the last page. What impressed me the most about this book is that the author wrote with such skill and portrayed a deep knowledge of medical matters in every scene involving the midwife at work with her patients. Clearly, Parr knows how to do research and write in a way that’s not only captivating but informative! I learned quite a bit about the life of a midwife and medical matters in the 19th century just from reading this book. The book is not just about the midwife, it’s about her defiant daughter Victoria who ran away with a theatre troupe. It’s an action that causes Martha great concern throughout the story. Another issue for Martha is the new doctor in town who is competition for her, so much so that she worries her career as a midwife will soon end. Such an idea hurts her heart not only because she loves her career but because she wanted her daughter to carry on the tradition of working as a midwife. While I do not want to give away the ending, I can say that the reader is not likely to be disappointed when they reach the final pages of this book as Parr does a delightful job of denouement in a way that satisfies most if not all of the reader’s curiosity. Historical fiction is not my favorite but I think this book deserves at least four stars because of the author’s way of sharing a fictional tale that was relatable and real. 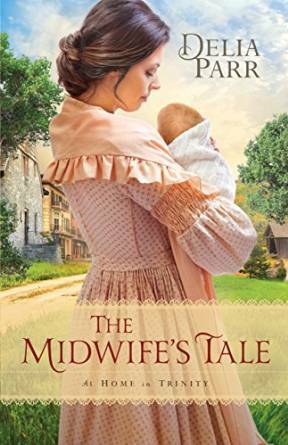 *Bethany House Publishers sent a complimentary copy of The Midwife’s Tale to Alexis A. Goring in exchange for an honest review. What is love to me through the lens? Love is sharing in those irreplaceable moments of our brides and grooms on their magical day, crying with them when they're so happy they don't know what else to do, and being able to be a part of their family and friends who are there to witness these special moments. Love to me is being able to CAPTURE those emotional, personal, and physical memories, to be viewed forever. Love to me means that my wants, desires, and needs are no longer my own. My husband deserves my everything. Love means giving my all to ensure his happiness is met before my own. Love means that I am complete. Love means remembering my vows every day. It means enjoying the easy times and pushing through the hard times. It means never forgetting how that first kiss felt. My name is Sara Roney. I am an experienced photographer of 14 years now. Continually, I am growing more, learning more, and striving to do and serve better! I love photography! I love serving and being a part of those “irreplaceable moments” that are so special in everyone’s life! It’s a real blessing to bring people happiness by using my talents that God has given me, as well as giving me more opportunities to learn and grow too! I have always loved photography. Growing up, I was always into art, drawing, and taking pictures. I guess you could say it was a built-in passion that God put on me. I am the eldest of 5 kids, (3 brothers, one sister) and my family was always very supportive of my skills and passions too…and for that, I am extremely thankful! I think it’s very important to be supportive of what your child wants to do with his/her life. They even enrolled me into a painting program with one of the top 5 artists in Maryland, Steve Burdette. That led me to a competition, which one of my paintings won 1st AND 2nd place in the statewide Md. competition! I even got to take one of my paintings to a National Art Competition, too! I am also a graphic designer by trade…so it's kind of neat to be able to see the photography and the graphic design walk hand in hand too. I'm just grateful for God's blessing on our business/es! We wouldn't be where we are without His favor and guidance!